Located on the edge of Lake Zurich in the middle of Switzerland, Zurich is the country's largest city and home to over one million people. Full of banks, chocolate, shopping, and fun, Zurich has a lot for travelers to enjoy. 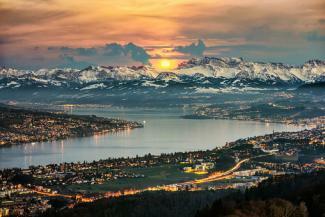 Zurich is a popular year-round destination as it offers a variety of both winter and summer activities and attractions. If you're looking to hit Zurich's warmest month, you'd want to visit in July when temperatures peak around 19C or 65F. Snowbirds will want to take advantage of Zurich's coldest month, January, when temperatures dip to 0C or 32F. The official language is German, but you'll find most people speak local dialects like Swiss German, which is mostly akin to standard German. You'll find English and French spoken in a number of places as well. You might assume Switzerland uses the Euro as its currency, but in fact they use the Swiss Franc (CHF). Their power outlets utilize the type J three-prong plug, so you'll want to have an adapter for your devices. Zurich has an international airport (ZRH) and it's recommended to take the Swiss Federal Railways to travel the seven miles into the city center. Taxis are available, but like many places in Europe, they are quite pricy. If you're driving, expect lots of traffic and limited parking options in the city. Another option for getting to Zurich is via train, which connects Zurich with other Swiss and European cities. Travel by rail is quite popular in Europe and it can be a cost-effective and scenic way to travel the continent. If you're looking to take the train into Zurich, long distance trains arrive from popular cities like Amsterdam, Frankfurt, Munich, Rome, Barcelona, Salzburg, Budapest, Zagreb, and more. You can research trains online, or if you're already in Europe, your local station office can likely help book your trip. Once you're in Zurich, many attractions are located close by, typically in Kreis 1 (The Old Town), so walking is definitely recommended for navigating this area. Other options include free bike rentals for travelers. Just show your passport, or some other form of ID, and leave a refundable deposit of 20 CHF. The two places to pick up loaner bikes are outside of the Swiss National Museum or the Civil Engineering and Waste Department. If you're visiting between May and October, there are additional pick up stations around town. 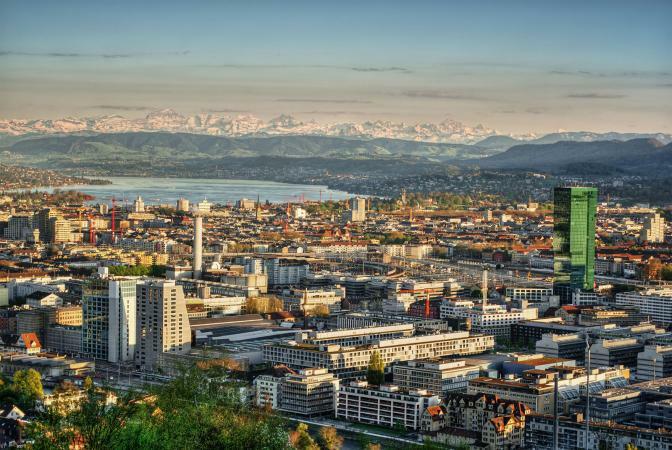 The city of Zurich offers a broad array of attractions to suit almost any interest. The Bahnhofstrasse is Zurich's "Rodeo Drive." Lined with luxury stores like Cartier, Rolex, Chanel, and Armani, as well as many important Swiss banks, this elegant pedestrian street offers wonderful window-shopping and people watching, even if you can't afford to buy here. Fraumunster, or Church of Our Lady, is located just off the Bahnhofstrasse. This Protestant church, built in the 13th century, has been renovated and expanded many times. Although the church has retained its Romanesque choir stall, it also boasts lovely, moving stained glass windows by Russian artist Marc Chagall, added in the 1970s. This church is a beautiful combination of architectural styles. Just outside of Zurich in Kitchberg, Switzerland is the Lindt Chocolate Factory. Lindt has been making luscious chocolate creations since 1845. In the factory, visitors get a view of the chocolate museum as well as free samples. Located near the Fraumunster, St Peter's Church has the largest clock face in Europe. Its second hand measures four meters long. This 13th century church is Zurich's oldest. Free classical music concerts are regularly offered here. Check the local paper for times. The Kunsthaus houses one of the largest portrait galleries in Switzerland, as well as a splendid collection of medieval art and Dutch and Flemish paintings. Works by masters such as Rubens, Hals, and Rembrandt are represented here. A small, but significant, 20th century collection features works by Giacometti, Segantini, and Hodler. Located near the railroad station, The National Museum of Switzerland is devoted to Swiss history from prehistoric times until the present. Interesting exhibits in this castle-like building include a section devoted to Swiss clock making and the medieval armor collection. The Rietberg Museum is housed in two elegant mansions, one of which was once home to Richard Wagner. These neo-classical buildings are now home to an impressive collection of Asian, African, and Polynesian art. Particularly interesting is the large collection of Indian, Chinese, and Japanese drawings and the somewhat frightening Japanese masks. One of Zurich's oldest guild houses, Zunfthaus Zur Meisen, is a magnificent rococo structure, originally built for the city's wine guild in 1752. Today, it is home to the Swiss National Museum's collection of 18th century Swiss ceramics. It's worth a visit just for the architecture. According to legend, this gothic cathedral with its two conspicuous towers was founded by Charlemagne. Arguably the city's most famous landmark, Grossmunster is dedicated to the three patron saints of Zurich: Felix, Regula, and Exuperantius. Completed in the 11th century, this cathedral has been added onto many times, most recently in 1932 to add the magnificent stained glass windows atop the choir loft. No trip to Zurich would be complete without a relaxing, scenic cruise on Lake Zurich. Spend a leisurely hour or two on one of Europe's most beautiful lakes. Boats depart regularly from Burkliplatz at the lake end of the Bahnhofstrasse. The streets of Zurich come alive in the spring and summer with a number of festivals. Every August, the huge open air techno rave takes place in and around Zurich. Streetparade features approximately 25 "Love Mobiles," which are brightly decorated trucks with music systems, various DJs and people, and they drive around Lake Zurich. In addition to the mobile stages, there are nine fixed stages along the route that feature top DJs and other live entertainment. Every two years, you can hit the Zurich Festival, a summer event taking place for approximately four weeks in June. It's organized in conjunction with the Zurich Opera House, Schauspielhaus Theater, Tonhalle Orchestra Hall, and Kunsthaus Zurich Art Museum. The festival focuses on a joint theme and the venues present various performances and exhibitions during the four week period. Held in April, Sechseläuten is a traditional spring festival. It dates back to the 16th century when it was decided that the Grossmünster church bell should ring to mark the arrival of the summer months on the Monday following the equinox. The "Böögg" has been the central part of the festival since the 20th century. 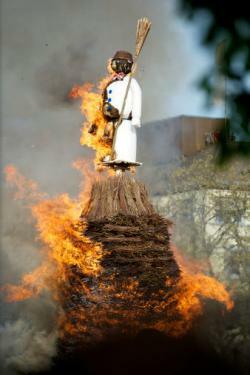 The "Böögg" is a 3.4-meter high snowman and the 10-meter high pyre it stands on is lit on fire around 6pm. It is believed that the faster the fire reaches its head, which is packed with fireworks, the better the summer will be. 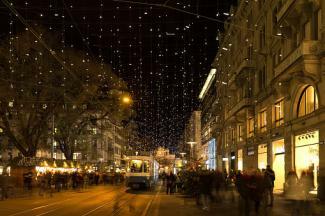 If you're looking to go out in Zurich, there is a wide variety of night life-everything from casual bars to classy clubs and live music venues. The main areas for nightlife are in the Niederdorf area of Old Town, and the streets around Zurich West and Langstrasse. In Your Pocket has a great round up of bars and clubs in Zurich, and they recommend having cash on hand as a lot of places don't take credit cards. Like the rest of Switzerland, there is no shortage on delicious local eats to try. One of the most recognized dishes from the Zurich region is Zürcher Geschnetzeltes. It's a creamy dish made with mushrooms and sautéed veal and/or calves' kidneys and sweetbreads, served with a side of potato rosti. Rosti is akin to a hash brown, but made slightly different. Potatoes are boiled then grated and pan fried until crisp. While it may seem rather cliché, fondue is definitely worth trying in Switzerland. The traditional mountain cuisine was once a hearty necessity during the coldest months, and it's easily found throughout the country from autumn to spring. Try the moitie-moitie, which is a mix of gruyere and vacheron infused with wine and garlic. Dip dark, dense bread into the melted cheese for a hearty snack. And, of course, pair with a local white wine for the full fondue experience. If you've visited a European Christmas Market, you may already be familiar with tartiflette. It's commonly found in many ski resorts and was conceived near the French-Swiss border. The hearty dish is made with thinly sliced potatoes, bits of chunky bacon, caramelized onions, and Reblochon cheese. Rebclochon cheese is from the department of Haute-Savoie, where tartiflette originated. While the cheese has been around for centuries, the dish is relatively new (around the 1980s) as the Reblochon trade union looked for creative ways to increase cheese sales. Another cheese-based dish to try is Raclette. From Valais, it is traditionally grilled over heat and then sliced layer by layer to cover boiled potatoes, pickles, and onions. Modern raclette machines make it easy to enjoy raclette as the cheese slowly starts oozing down the side. This is definitely a dish you want a few hours to experience as it takes quite a while to enjoy. You may see it referred to as the Bünder nusstorte or Engadiner nusstorte, which refers to where it originated. This sweet nut tart is not to be missed. Each bakery has its own recipe, so if you see this in Zurich, try it in a few locations! If you visit the Lindt Chocolate Factory, you'll hear this cafe referenced. Sprüngli started in 1845 when a father and son started manufacturing solid chocolate in their small shop. Rodolphe Lindt developed the first melting chocolate and went on to sell the business to Sprüngli. Be sure to try the Luxemburgli miniature macarons, one of the cafe's specialty items. Elite Traveler recommends Kronenhalle as it's a traditional Swiss kitchen and is one of the oldest and most famous restaurants in town. Celebrities like Coco Chanel, Pablo Picasso, Richard Strauss, and Yves Saint Laurent have all dined here. Don't miss the selection of art on the walls from masters like Chagall, Mirò, and Matisse. 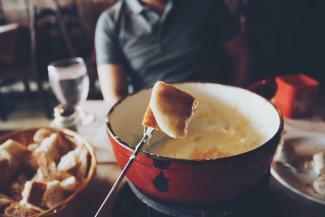 If you're looking to try local specialties like fondue, raclette, and rosti, The Culture Trip recommends you head to Restaurant Swiss Chuchi. Located at the Hotel Adler, it's a great stop when you're touring the Old Town. Because of Zurich's history as a financial center, many travelers come with expense accounts so there is definitely a noted presence of high-end hotels. There are some hostels and mid-range options, but do your research. A lot of people prefer to stay in Kreis 1, or the Old Town, since it's convenient to many attractions and it's where the Limmat River flows out of Lake Zurich. Zurich Youth Hostel: Those on a real budget will find Zurich Youth Hostel has some of the cheapest rates. It's located a bit out of the city center, so factor in multi-day transportation into your budget. It does have free Wi-Fi and basic breakfast included in the price. A single male can book a dorm room in August starting at 40.50 CHF in a 6 bed room or 118 CHF for a private single. Townhouse Boutique Hotel: This simple, yet boutique, hotel is located just a block away from the main train station. People love the Townhouse Boutique Hotel for its convenience, but don't expect a lot of frills here. Rates for a weeknight in August start at 216.75 CHF for a small double room, up to 293.25 CHF for a junior suite. The Dolder Grand: Considered by some to be one of the best hotels in all of Europe, The Dolder Grand is where you want to book if money is no object. It's located in Kreis 7 but is easily accessible from Old Town via the hotel's free shuttle. The 173 rooms are elegantly appointed and there is a spa, gym, two restaurants, cafe, and a bar. 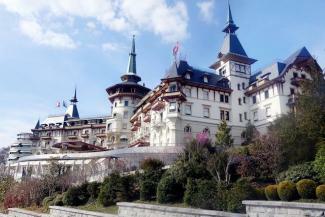 Be sure to reserve a room on an upper floor overlooking Lake Zurich if your budget allows. Sample rates for a weeknight in August start at 680 CHF for double view superior room with forest view and go all the way up to the Suite Grand with roof terrace and butler service for 3,520 CHF a night. Despite being such an expensive and historically corporate city, you should always use common sense and exercise caution in Zurich, as you would in any other large European city. Crime is not as high as other cities, but there are some incidents of pickpockets and theft, so keep your belongings close and always remain aware of your surroundings, and you shouldn't have any issues.